Having kept yours of the 3rd lying unanswered on my table long enough to whet your appetite for a reply, I sit down to satisfy(?) you by filling a few lines with such matter as I can find in lieu of news. Both your letter and Charley Kent's were keenly enjoyed not only because they were from two dear friends, but also because they were full of University news. I sincerely hope that the result of the medal contests will be as satisfactory as the issue of the race for the Was presidency. What do you think will be the effect on the minds of the judges of the change of name of the medals—of the use of the word speaker. Although Lefevre's mind is capable of constructing a fine argument, his diction rather clouds his meaning and his delivery is not such as to give it the force it might otherwise possess. 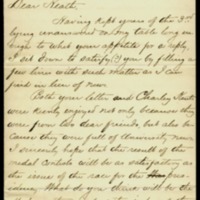 I suppose is he is the first speaker among the contestants; but I have thought that possibly a sudden inspiration coming upon one of his opponents might throw doubt upon that fact.—But all this will possibly be settled by the time my letter reaches you. I shall expect both you and Charley to give me very full accounts of the contests. By-the-way, who is to be president and who are to be medalists of the Wash? What prospect has she for an interesting exhibition at the Finals? And who is the most prominent candidate for the Magazine medal? Has James' star gone as completely down in that contest as in the other? How are the Standing committees of the new Constitution of the Jeff. working? I'm overwhelming you with questions, I know: but I've not asked half the number I would like to have answered by you. I've turned professor of Latin since my return home. There are no schools here of any worth at all, and, consequently, my younger brother has to be instructed at home. I have charge at present of his classical education and find the exercise of teaching an excellent training for myself. I had an idea that I knew a good deal about Latin until I came to teach it. Of late teaching the grammar has not been my only exercise in Latin, however. I've been reading Trollope's recently issued life of Cicero and have of course made it a point to read most of the passages in Cicero's works to which Mr. T. refers passim. Of course Cicero is easy to translate, but I experience the consequences of three years' neglect of Latin even in reading him. My principal trouble is, of course, is a loss of a Latin vocabulary But facility of translation is rapidly coming back to me. As for Trollope's work it is simply charming—as vivid and entertaining and instructive as Fox. I see by this morning's paper that the schemings of my friend Beaconsfield are at last at an end. His death has not inclined me to any Jamesian snuffles. The old fox could not have lasted much longer and I'm prone to feel only releaf at his departure. From many things I've recently seen afloat in the papers I am apt to think, too, that the regret of the tories at his loss(?) will be only of the lips! Give much love to Charley, Harry, Pat, Geo. P., Hunter, and my other friends. I think of them much and often. Wilson, Woodrow, 1856-1924, “Woodrow Wilson to Richard Heath Dabney,” 1881 April 20, WWP20421, University of Virginia Woodrow Wilson Letters, Woodrow Wilson Presidential Library & Museum, Staunton, Virginia.